Does a runny nose, nasal congestion, headache, ear pressure or other symptom have you suspecting allergies? Allergies are the result of the body’s abnormal response to typically harmless substances (allergens). Symptoms such as a runny nose, recurrent ear fluid, nasal congestion, recurrent sinus congestion and infections, headaches, hives, asthma, stomach complaints, fatigue and skin conditions may be caused by allergies. Spokane Valley ENT’s experienced team of allergy specialists can help determine if allergens are the culprit of your discomfort. We test for airborne allergens that are common in the Spokane area and the greater Inland Northwest region. These include grass, tree and weed pollens, and molds, dust mites and animal dander. 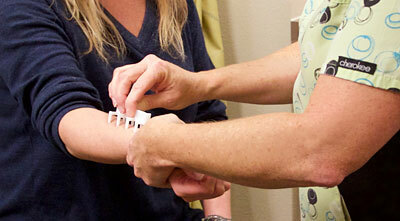 A plastic device is used to test multiple allergens with minimal scratching on the surface of your forearms. This testing does not involve needles. The allergy tests used in our office have been endorsed by the American Academy of Otolaryngic Allergy as safe and reliable methods of allergy testing. Our doctors and nurses will develop a treatment plan based on your test results that may include changes to your home environment, recommendations for medications, and allergy shots or drops.